Sky TV Customer? – Are You Being Massively Overcharged for Your Loyalty? Like many companies, Sky TV do not reward customer loyalty with low prices. Instead, as an existing loyal customer, you can expect your Sky TV monthly bill to be increased, year on year. Without realising you could be overpaying double or more than other Sky TV customers with the exact same package. However, Sky TV is well known for easily dropping their prices if you simply ask them. It doesn’t cost them anything to send the signal to your Sky Box. They will, therefore, offer good deals if they think there is any chance they might lose you as a customer. Below, I outline 4 ways existing customers can reduce their Sky TV bill without cutting down on the package. Don’t worry if you are not used to haggling because if you’re near the end or out of contract Sky will work hard to keep you. 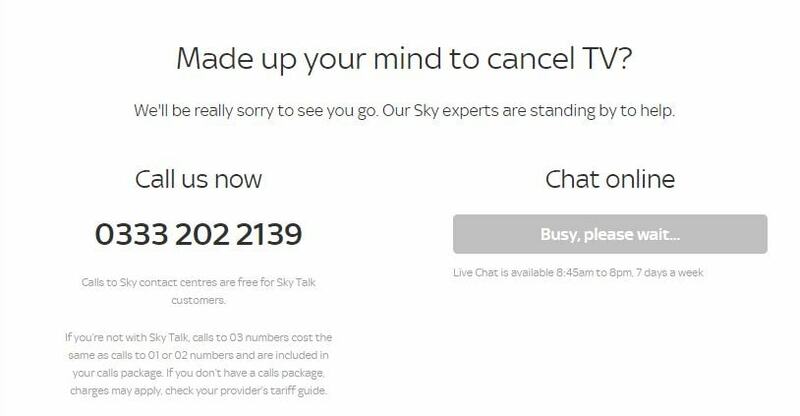 This is the easiest way to reduce your Sky Tv bill and you don’t even need to talk to anyone. Step 1: Login to your Sky Account. Step 2: Search “cancel” in the search box at the top of the page. Or visit directly via this “Cancel Sky TV” link. Step 3: You will find yourself on a page like you see below. Click the left-hand box “Looking to cancel your Sky TV”. Step 4: Next, you will then go to this page as shown below, select the option that I have highlighted with a tick “I’m worried about the cost”. Step 5: You should then be offered 10% discount off your Sky Tv, but note it’s an 18-month contract and you may be charged for ending this early if you wish to do so in the future. If you click “Tell me more” you will be presented with a page to accept the 10% offer, as below. However, if you have come this far, I’d really encourage you to put in just a little more effort and get a much bigger discount! 2. Save +25% On Your Sky TV Bill – Call Them Up! 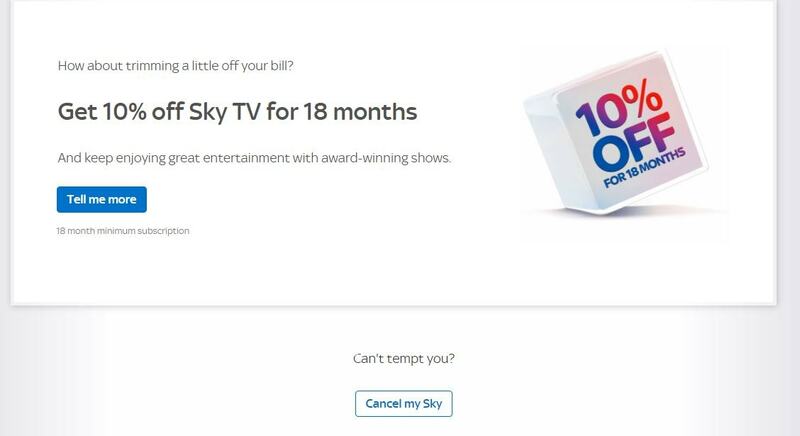 Assuming you have logged into your Sky Tv account as outlined above, you’ve now seen how easy it is to get 10% off your Sky TV bill. You have 2 options. Phone them up or Live Chat. Chose the option you are most comfortable with. I personally recommend using the phone, as in my experience, it was a very quick phone call. I have heard of some people saying the Live Chat is often busy and a generally a slower process than a phone call. Don’t think of this call as a cancellation line. Think of it as a Customer Retention line. 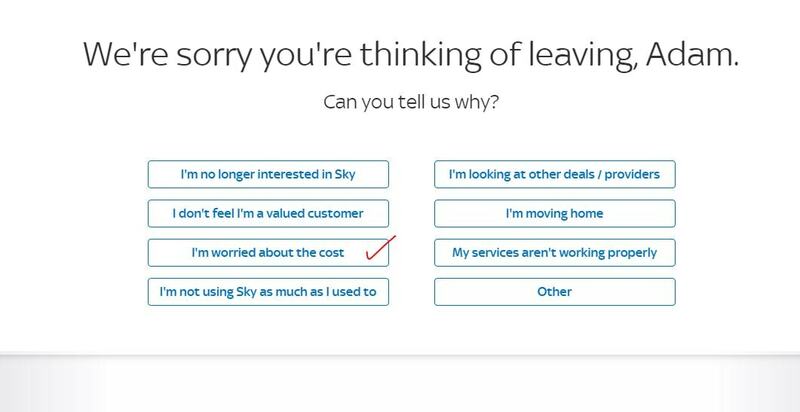 Sky TV do not want you to leave and they will offer you a good deal to stay. When I rang Sky TV, I was put through to a very friendly, well spoken and professional customer assistant. They actively wanted to see what they could do for me. This is great as it makes it easier to be nice back in the hope of securing a low price. All you have to do to get your Sky TV discount is tell them you want to cancel because it’s becoming far too expensive. If you wanted to, you could ring a competitor, for example, Virgin Media and get a price for the same sort of package you have with Sky. You can then use that as your base price. Tell Sky to beat it or you will switch. You don’t have to switch if you don’t want to. But Sky will work a little harder on this call to keep your custom. If you want to hold out for a bigger discount all you have to do is continue with the cancellation. This may well feel better if you are actually willing to switch because you’ll know you have an alternative digital tv provider lined up and therefore be more resolute on getting the very best Sky TV discount. Within a few days expect to receive offers of a 50% discount. These may be sent to you via post, your online account, be a phone call, or even be shown to you via your Sky TV. It’s up to you whether you accept the offer or wait it out for more. If you turn down or ignore the 50% discount offer, you may well be offered the 75% discount without having to do anymore. However, if you don’t directly receive the 75% offer, there is a strategy for getting it. Timing is important here. You basically have to wait 3 weeks and then if no offers are forthcoming ring up a specific Sky TV telephone number and claim the 75% off your Sky Tv Bill as an existing customer. All details are in the link above as should any subsequent changes to getting the deal or contact telephone numbers. Some customers have been doing this 75% sky discount strategy for years! For those of you looking to go for the best digital tv deal possible, it makes sense to find an alternative digital Tv provider. 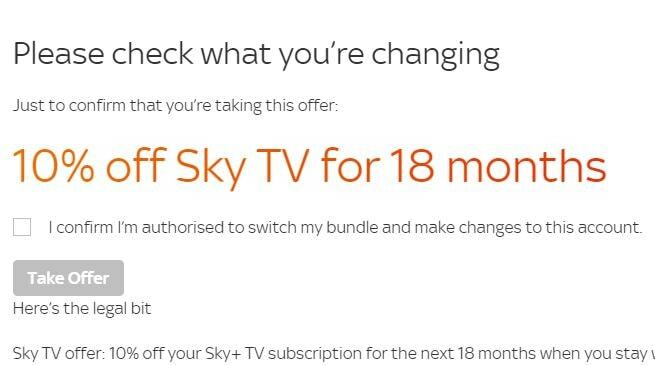 If you don’t end up getting the deal you want from Sky, you can go ahead and switch to another company. Here’s some info on best current Digital TV Deals & Freeview. As a new customer of a digital tv provider, you’ll typically get a great deal for at least the first 12 months. At which point you can repeat the ditch and switch process and possibly end up back at Sky on a really cheap new customer deal. Whatever options you do, always keep an eye out for added cashback deals from the best cashback sites. The main competitor in my area for Sky Tv is Virgin Media, and just looking now on Topcashback they are offering new customers £42-£84 cashback depending on what bundle you opt for. This is on top of probably getting a lower price as a new customer than what you are currently paying for your Sky Tv. Read my full TopCashback review here. They are one of my favourite money saving sites. You could choose to simply ditch Sky TV and go Freeview for a while or even permanently. This is certainly worth considering for some of you if money is tight or you are saving for a house deposit or aiming to reduce debt etc. 98.5% of the population can get access to Freeview. Many modern televisions will have Freeview channels built in. If needed you can buy a Freeview box to record, rewind and pause live tv. Make a note of the contract end date, on a calendar or alert reminder on your phone. When your contract ends so will your Sky TV discount. Sky Tv will almost certainly put the price back up. So its best to repeat the discounting process again as soon as possible before being charged the higher amount. I was content with this Sky TV discount for the few minutes I had put into getting this reduction in price. During the actual phone call, I pushed hard for a bigger discount. I mentioned switching to Virgin and getting cash back. I also told them I’d be happy with Freeview for a while. So I felt comfortable I wouldn’t have received any more discount from them at this stage. Chances are the customer retention team taking these calls at this stage don’t have the authority to offer bigger discounts. If ever there was a utility bill worth haggling with it’s Sky TV. It costs SKY nothing to send you a signal to your Sky Box and they will work hard to give you the best deal to keep you as a customer. All you need to do is make them do that work. Good luck! 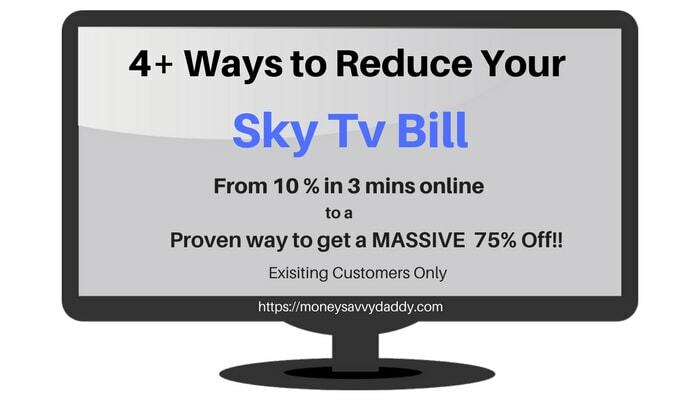 After you have had a go at getting your Sky Tv discount, please feel free to comment to let me know how much you saved. Do you have any other tips or tricks for getting a good deal on any Sky TV? This is brilliant. We used to do this when I was with sky all the time. It’s amazing what “offers” they come out with once you threaten to leave. We also used to switch between them and Virgin and make the most of the new customer offers. Great tips, really useful money savings! Switching between Sky and Virgin is a great idea. Especially if you get cashback on top of the new customer deals. Does switching go through okay? Any issues with the Sky or Virgin boxes? DO you have to keep them? Or do you get new one each time? Sky don’t tend to care but virgin have you send the boxes back. But the new customer offers are always the best!